Yup, noon a cappella performance in a cave. You're not at the West Senior High Auditorium anymore kiddos! Postajna Cave features a Concert Hall, Post Office (not kidding), Vivarium and a Medieval Castle. Goodbye Vienna as we depart for Ljubljana, Slovenia. A stop will be made in Eisenstadt for a guided tour of the Esterhazy Palace. The tour will end in Haydn Hall, known for its almost perfect acoustics, very similar to what we experience at the West Senior High Auditorium. Then walk to St. Mary’s Church to view the tomb of Joseph Haydn located in the crypt. Grab a bite to eat in Eisenstadt then its on our way to Ljubljana. Ljubljana is the capital of Slovenia, the largest city and economic and cultural center of the country. Its history dates back thousands of years. Around 50 BC, the Romans built a military encampment that later became a permanent settlement. In 452, it was destroyed by Attila the Hun’s forces and later by the Ostrogoths and the Lombards and probably one of the students in Clash of Clans. In the Middle Ages, the city was recognized for its art and it was rebuilt in the 16th century in the Renaissance style. After checking in to the hotel we meet our guides and begin a leisurely walking tour of the historic city center except for Mr. Gailey who will be forced to jog the entire tour. The day starts with breakfast at the hotel and if you've never had the complimentary breakfast at a European hotel prepare to be impressed, no broken make-your-own waffle maker here. Wear sensible shoes for the bus and walking tour of the Vienna. Your local guides will point out the highlights of the city including the Opera House, Hofburg Palace and Stephansdom. 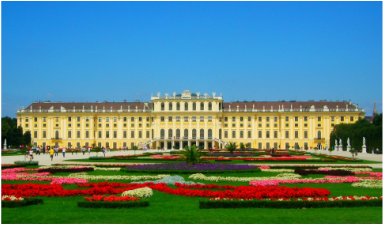 Vienna is the Austria’s capital and the cultural, political, and economic center of the country. Vienna is considered the City of Music , as well as "The City of Dreams" as opposed to"The Field of Dreams" because it was home to the world's first psycho-analyst – Sigmund Freud not a baseball field in Iowa. Vienna was transformed from a Celtic and Roman settlement into the Baroque capital of the AustroHungarian Empire and if it's not Baroque don't fix it I always say...ahem, where were we. It played an essential role as a leading European music center, from the great age of Viennese Classicism through the early part of the 20th century. The historic center of Vienna is rich in architectural ensembles and vocal ensembles as the tour will end at the Stephansdom for a 30-minute rehearsal. Lunchtime entertainment will feature a performance by the remarkable Traverse City West Senior High School Choir (that would be us) at St. Stephen’s Cathedral. Following the performance enjoy some free time for independent exploration (in small groups) of the beautiful city center or just take a nap. The day concludes with dinner and either a Strauss & Mozart concert by the Salonorchester Alt Wien, in the Kursalon Wien, an exquisite palace in the City Park where the Strauss (not Levi Strauss) brothers had their greatest successes or a trip to Vienna Woods for Heurige dinner and folkloric show, again without Levi Straus. Get your sleep in before the trip because you are going to be busy. Check out some of the links below and may your mind be blown! - Very long transatlantic flight with airplane food, Yum! Trust me it does get better. Did I mention we land in Vienna, Austria? - Don't plan to get settled in because the touring starts right after we land! Get on the bus (with all of our luggage) and away we go. Let's start with a guided tour of Schönbrunn Palace to include 22 of the sumptuous rooms. You’ll also have time to explore the beautiful gardens* before continuing on to your hotel in the city center. *Gardens are where plants and flowers grow in case you've forgotten over the winter. Click on the photo for a closer look?